This week I am heading off travelling to Singapore and Kuala Lumpur. The great packing will commence, key beauty products in smaller sizes. The weather looks to be 31 degrees and tropical thunderstorms. With all that heat the question is how to soothe sensitive skin whilst on a limited packing allowance. 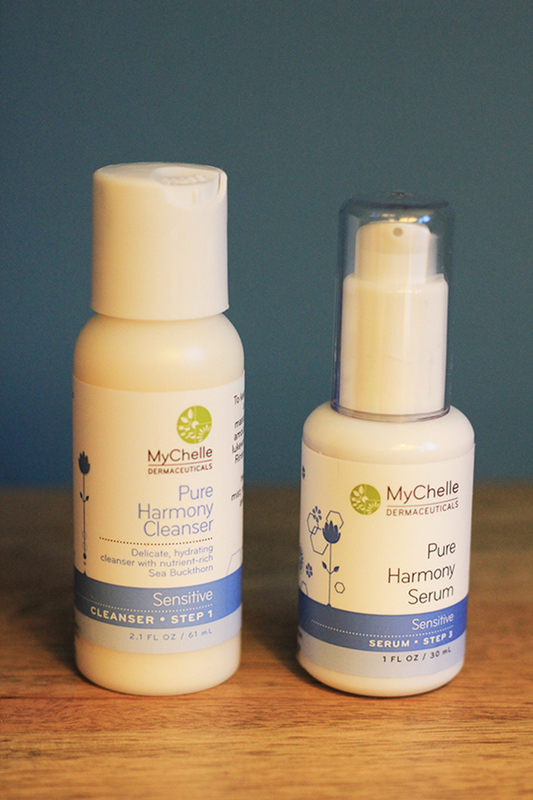 The team at MyChelle just happened to send over samples of their Pure Harmony Cleanser and Serum just before the packing commenced. 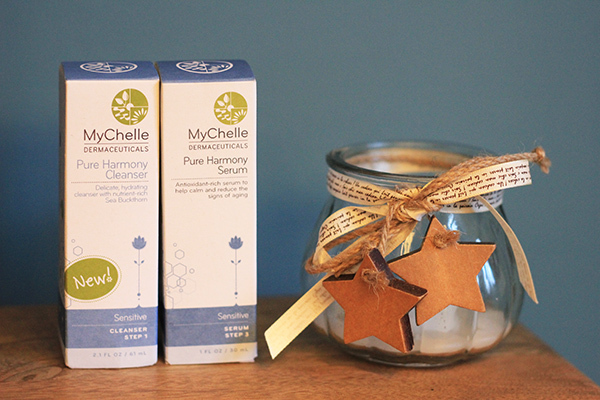 MyChelle are the pioneer and authority in advanced, bioactive skin care, MyChelle transformed the natural beauty industry by being the first to use anti-aging peptides, plant stem cells, and clinically proven dermatological ingredients. As with anything new, I have given them a try before I head off travelling, but as 61ml for the Cleanser and 30ml for the Serum; they are perfect sizes for my carry on and great for soothing my skin in the air. I don’t have super sensitive skin, but I do find it needs just a little more TLC when travelling, so testing out these two skincare products has come just at the right time. They are part of a three step skincare regime. 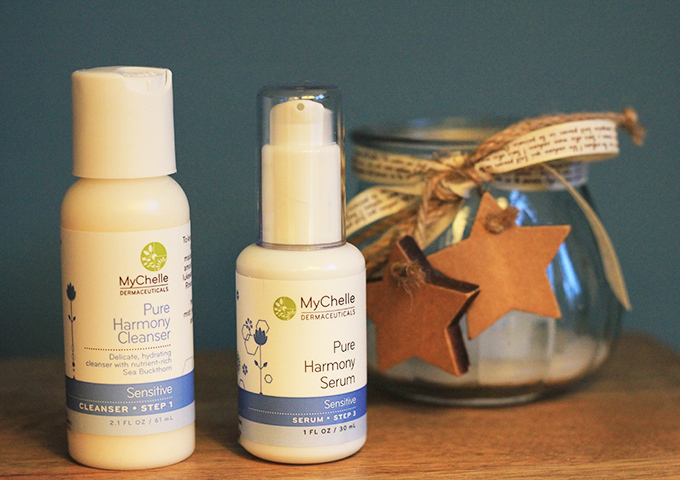 Cleanse, mask and serum. I was just testing out part one and two, which to be honest is normal for me. I only use a mask when having a facial at Beauté, my beauty boutique in Tunbridge Wells. So first the cleanser. I have tried a lot in the past, creams, milks, oils, Micellar cleansing water. 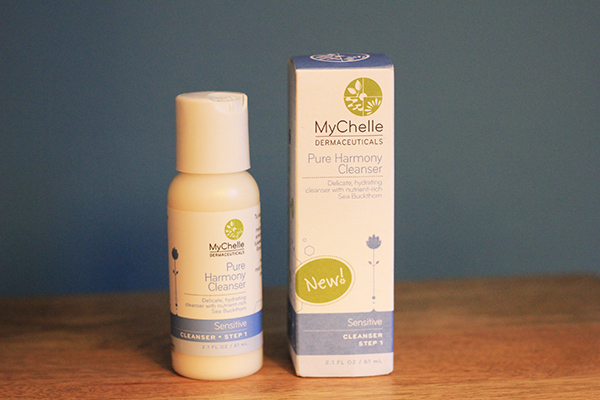 For me a good gel/cream hybrid usually works and the Mychelle Pure Harmony Cleanser in this well proportioned travel size, worked for me without any irritation. It soothes sensitive skin whilst moisturising and nourishing. 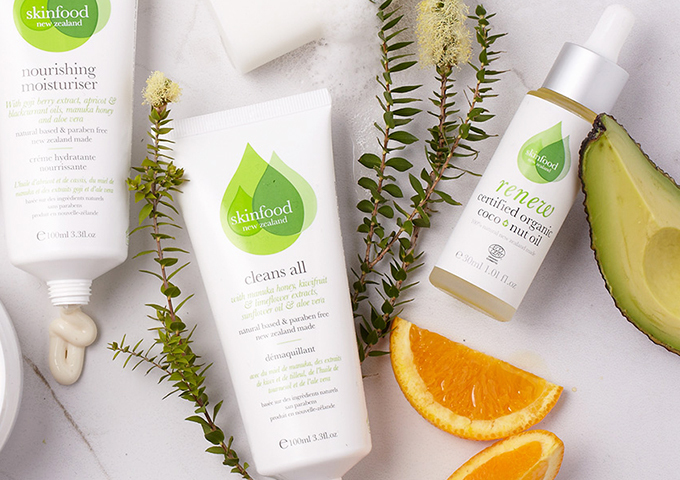 A lot has been said of products that contain Green Tea recently and this ingredient combined with Sea Buckthorn and AquaCacteen works a powerful treat without irritating your skin. I must admit I tried an ice-cream last week with Sea Buckthorn in it, I didn’t think much of this Asian fruit but it is rich with omega-7 fatty acid and has been a powerful remedy used in Asia for over 1000 years in treating a variety of skin problems. Now what is AquaCacteen, I hear you cry. Well it is a succulent that is exceptionally resistant to strong sunlight and extreme drought. With these qualities it naturally hydrates and soothes skin and protects against environmental stress. To keep skin ultra-soft and clean, gently massage a 5 pence piece size amount onto skin with lukewarm to cool water. Rinse completely and follow with the serum or nourishing day or night cream. Now I am not really one to use serums. I hate adding anything to my face that might be oily, gloopy or basically cause an imbalance from my normal skincare routine. 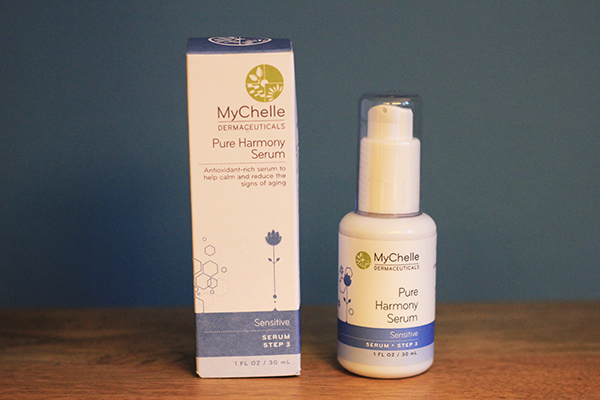 However the Mychelle Pure Harmony Serum is an antioxidant-rich serum reduces the appearance of puffiness while calming and brightening skin without irritation and to be honest feels pretty darn good when on the skin. This will be great for my inflight skincare regime. Before putting my eye mask on and trying to get some shut eye on my long haul flight I will cleanse and then add this serum. 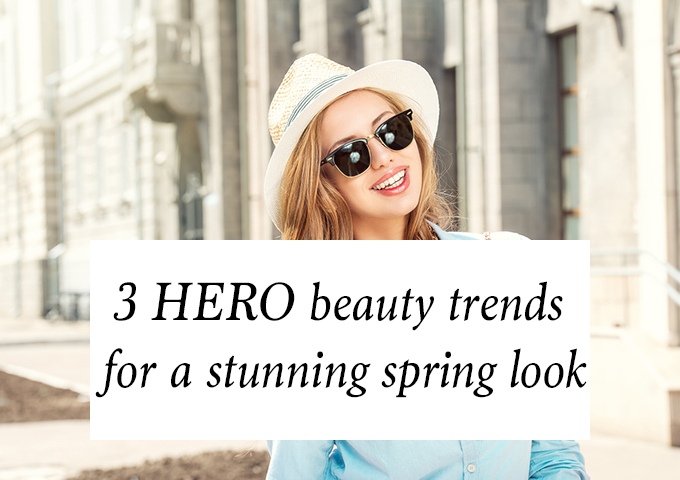 It gives the skin a fresher feel and a pretty good glow. The active ingredients Niacinamide (the water-soluble form of vitamin B3), Kinetin and Licorice, can get to work whilst I try to sleep on the flight. The serum is really restorative and cools, calms and brightens sensitive skin without irritation. Niacinamide is a new ingredient for me so I thought I’d tell you a little more about it. 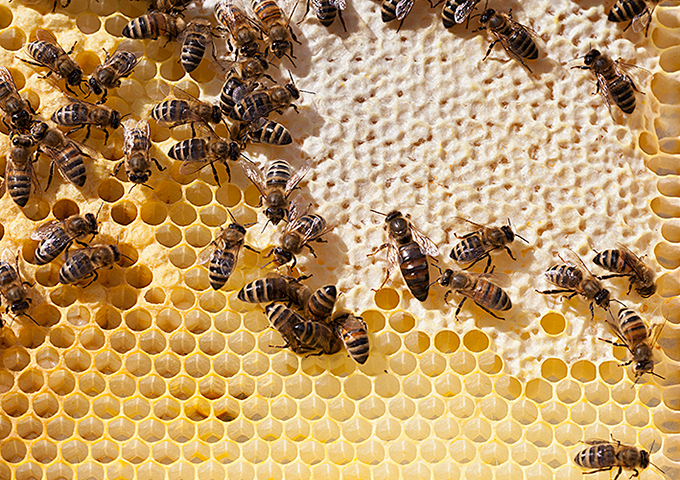 It is a water-soluble form of vitamin B3. It provides potent anti-inflammatory and anti-glycation activity. Has anti-aging effect by stimulating collagen synthesis and improves barrier function and reduces hyperpigmentation. Sounds pretty good to me. All you need is two pumps after cleansing. I’d follow with my This Works In Transit Spray-On Moisture mist and let my skin glow. What are your key beauty products you always take with you when travelling? What’s your inflight skincare regime? P. S Make sure you check out my 6 ways – how to stay stylish during a long haul flight, for ultimate style with comfort for those long flights.